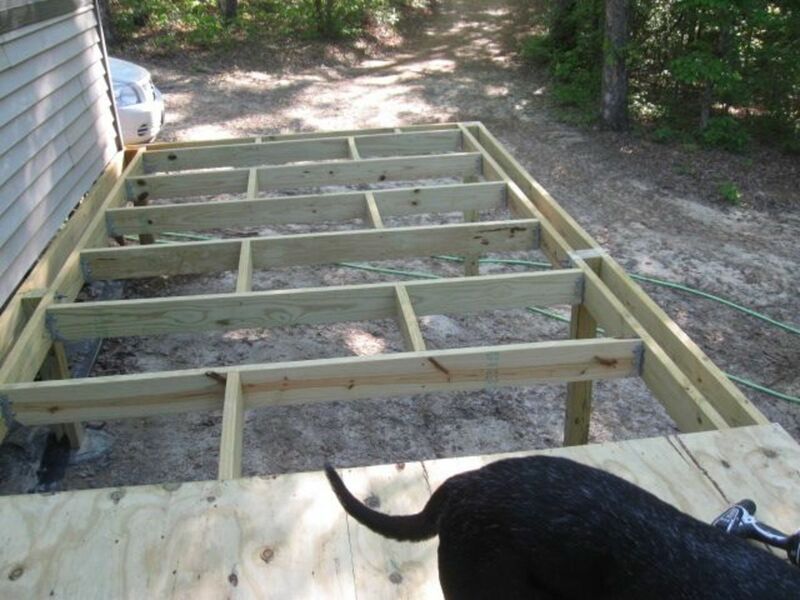 Elevated DIY low budget deck on uneven slope. This article will explain how to build an elevated deck with common tools, on a budget, in female speak. My husband and I built this ourselves. Mostly it was him but I helped some. Technically, we are still working on it. Remaining work now though is all cosmetic. The functional parts are done. We saved a boatload of bucks. Neither of us are carpenters but each has built things around the house in the past including porches, a gazebo and so on. I got some professional estimates to have this built before we decided to tackle it ourselves. They ranged from just over three thousand dollars to just over five thousand. I think...NOT! In a big time kind of way. Who needs to shell out that kind of cash? I'm way too cheap to pay that. 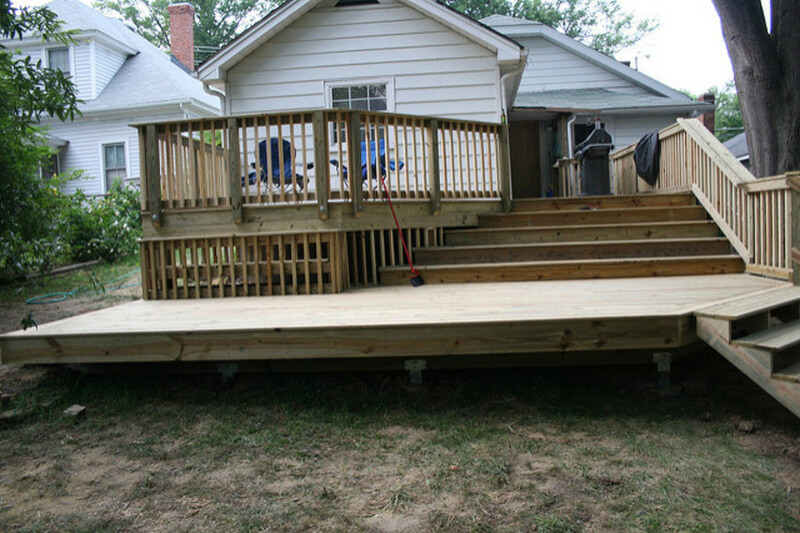 We built this 8 x 20 elevated deck for just under five hundred. That's a fraction of what the professionals wanted. As you can see, ours has a solid plywood floor. 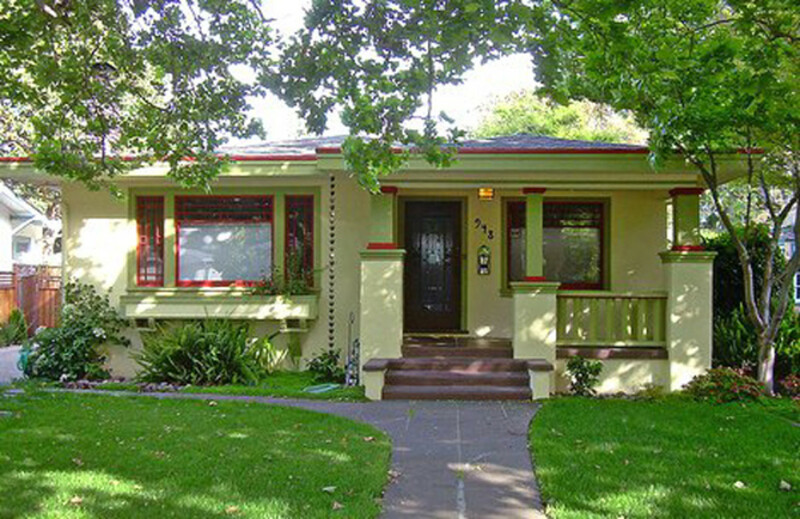 This could be done in decking boards for a more traditional look. We are going to screen this in after building another larger one in the back. With traditional boards, the mosquitoes would just come up from the bottom. Later, I will cover this not so attractive plywood too but that's the subject of another article and separate budget. Follow along to see how you can build your own and save your cash. I won't tell you it was easy. In fact, it's kind of hard. The construction is not rocket science by any means but lumber is heavy and it's not always easy physically. We learned a few things here that I will share including pitfalls and some time and labor saving tips. Let's go outside and get started. The setting of the poles will make or break this project. Sawsall or cheat and use a chainsaw like we did. 1. 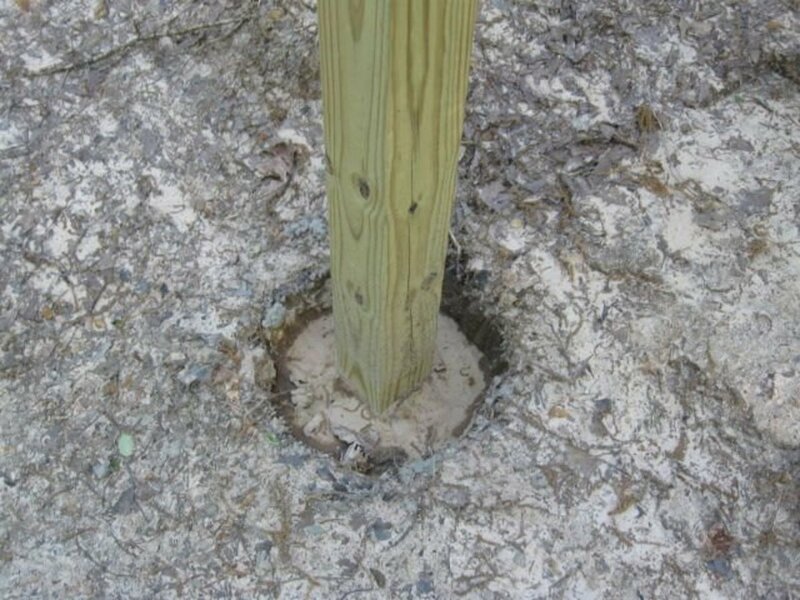 After determining where you want your structure, you will need to dig the holes to set the posts. My husband had already started this project before I thought to document it with pictures. Sorry. We did this in multiples of four because lumber comes in eight foot lengths and plywood comes in four by eight foot sheets. Building something eight by twenty ensured minimal cuts saving labor and materials. There are four posts on each twenty foot long side. At the steps, there is a corner post. 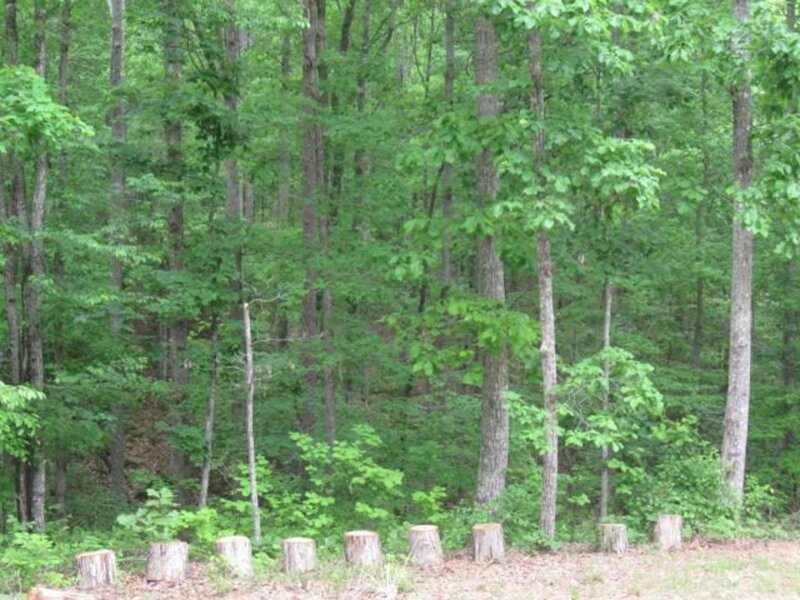 From there, there are two posts spaced eight feet apart. The last is spaced four feet away. This is because that's as big a deck as we wanted. The same spacing is repeated for the other long side. Get a buddy to help if you can. Wear the gloves or you will get splinters. Don't skip the rocks or it's going to sink. Dogs will try to eat wet concrete. It's really bad for them. Right after setting the poles is a great time to supervise the kids to put their palm prints and names in it. Years from now, you will all get a huge kick out of knowing it's there. Don't do more work than you have to. 2. Post holes were dug down two feet. Tip: To determine how wide to make the hole, simply center the post hole diggers where you want the hole and use one side to trace out a perfect circle. Digging within the circle ensures you have enough room but aren't digging more than you have to. Tip: Once dug, line the hole with a few inches of rocks to ensure the posts will not sink over time. There's a reason for that soap when using a drill. 3. Assemble the front and back frames. Most people would set the post and then build onto them. My hubby wanted to be sure about the spacing being perfect so he wouldn't have to do any extra cuts. So, he built the frames onto the posts before sinking them in the ground with concrete. To the front and back of the first three four by four posts is attached an eight foot long two by six pressure treated board. The attachments are done with heavy duty bolts, washers and nuts. 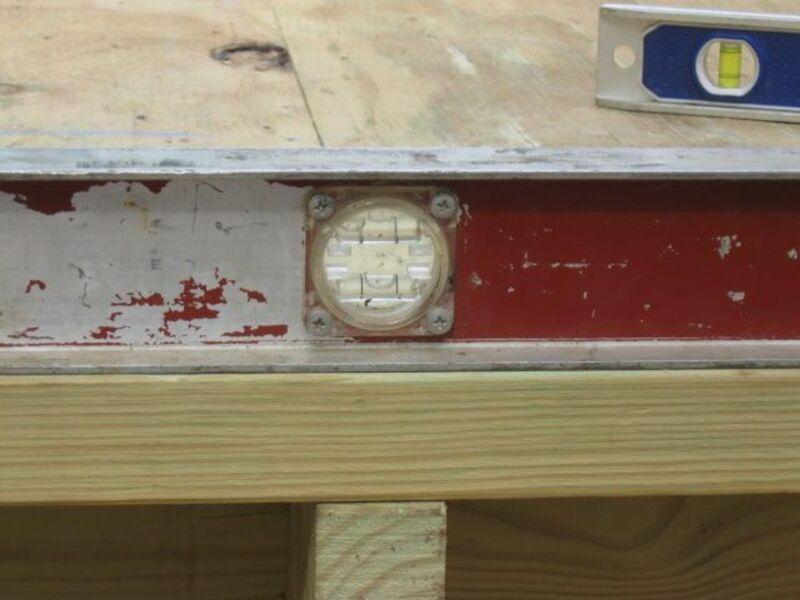 The last board was cut to four feet before being attached the same way. You will need to drill the holes for the bolts. 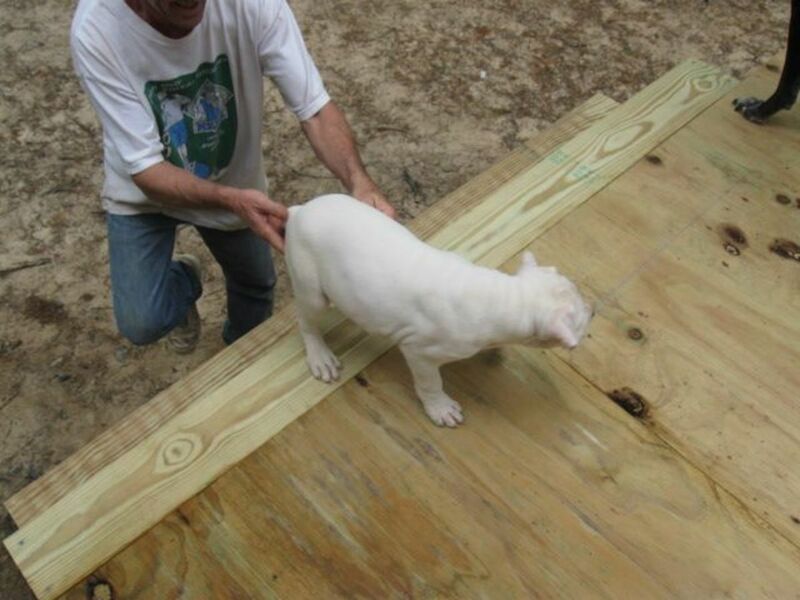 Be sure to use a level before attaching the boards so everything stays good and straight. 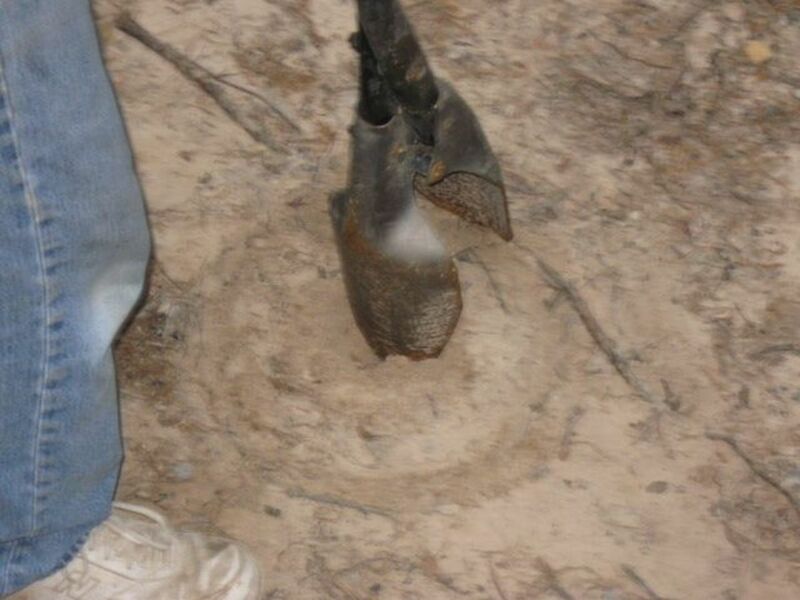 Once the four posts were connected, the two of us picked up the entire assemblage and dropped it in the holes. Yep, it was heavy. But this deck is perfectly square with almost no cuts needed, so I would do it this way again. Big, chunky bolts don't break like little skinny ones. 4. Do connections with heavy duty hardware to ensure it lasts. As you can see in the picture, the posts are secured to the frame by two heavy duty bolts through each. IMPORTANT: The ground here is far from level. In fact, the entire thing slopes down. You have to measure from the ground up for each post in regards to how high to attach the two by six boards. The posts by the stairs are on higher ground that the ones on the other side by almost a foot. From one side of the stairs to the other is a 10 1/2 inch slope. 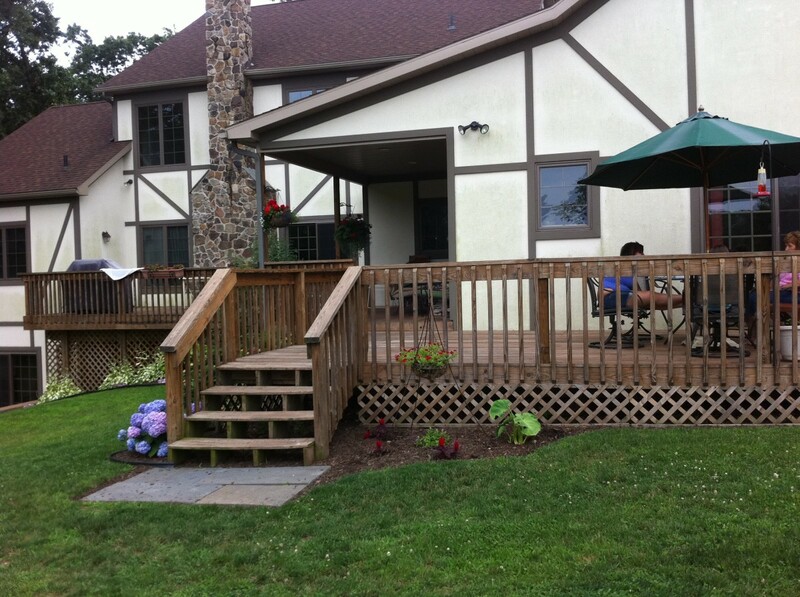 Measure, measure, measure to ensure your deck is good and level. Remember, the plywood that will cover this will raise the height another 3/4 of an inch. Be sure to take that into account when doing your measurements. The posts are taller than needed at this point. Don't worry about it. We will fix it later. 5. Mix your concrete and set the posts. Be sure to wear a face mask and safety glasses for this. Mix one bag at a time in a wheel barrel according to the directions on the bag. Keep the water hose handy. Each post hole will require two bags. 6. Connect the perimeter framing. Attach the eight foot long outer perimeter on each of the two remaining short sides. 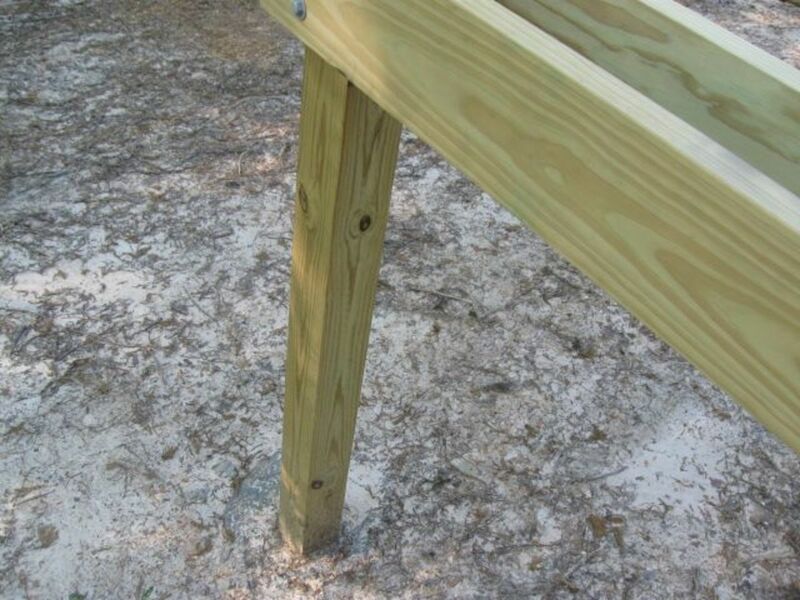 Be sure to check with a level and square before drilling. Heavy duty bolts were used to make these connections. Don't take a chance with a light wieght bolt. Decks tend to support heavy objects like furniture and little ones running around. Go sturdy now to be sure you don't have to make repairs later. The clips add a lot to structural integrity. 7. Bring on the joists. Attach the floor joists. 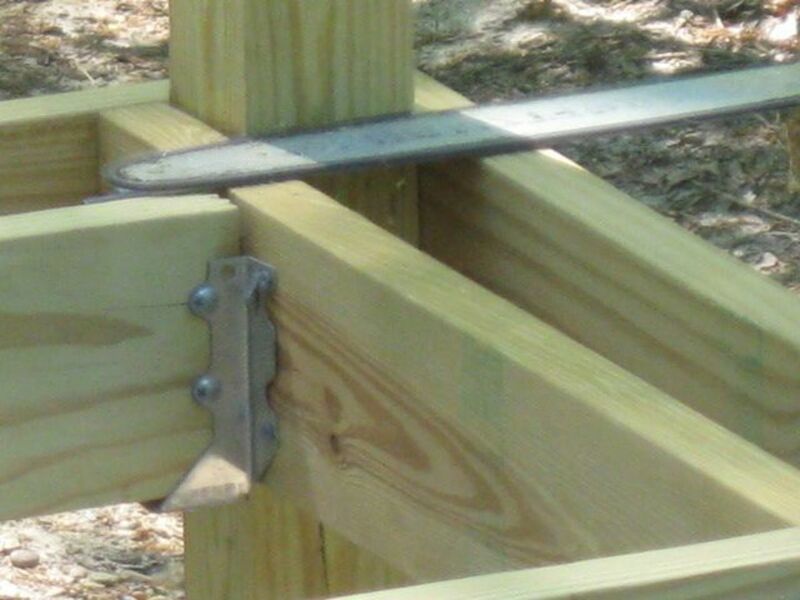 The attachments here were done using joist hangers also known as hurricane clips. Joists were spaced two feet apart. One and five eighths inch screws were used to make the connections. 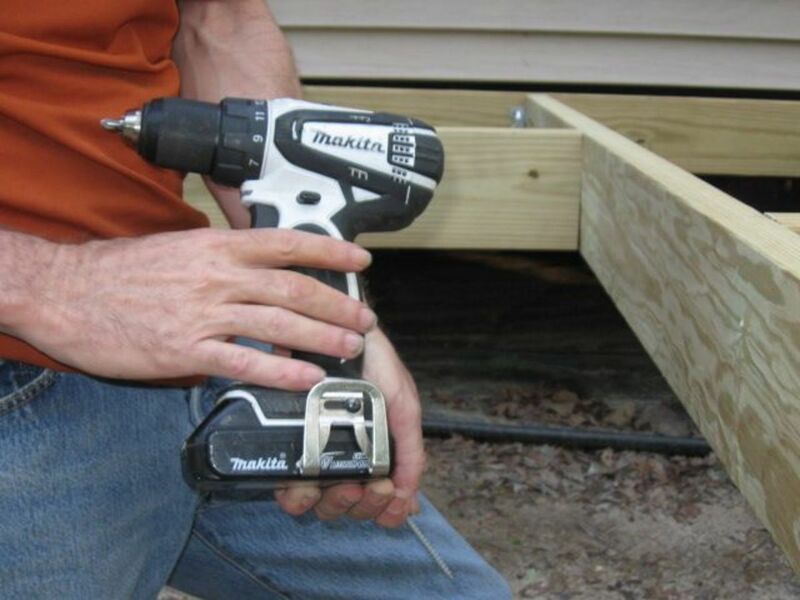 Tip: Always use screws instead of nails for porches, decks and the like. They are not near as likely to back out over time. 8. Now that you have joists, bring on the struts. Put in the struts between the joists. We did one per row alternating the placement to provide added support. This step does require some cutting of the two by sixes. Mr. Lytle used the circular saw to make the cuts. All struts were attached with screws using a power drill. It should be looking like a frame right about now. 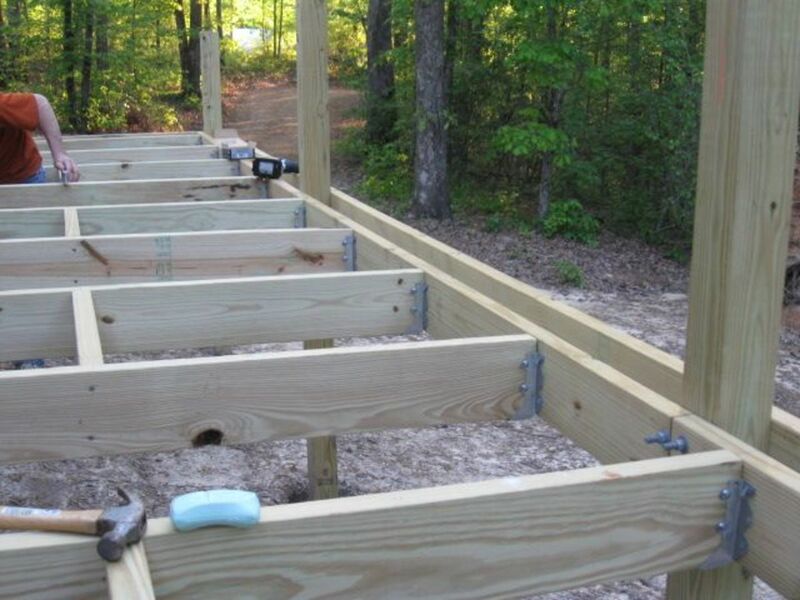 By the time you get the frame done, joists hung and struts in place it should look something like this. Female speak translation: The joists are the long boards inside the frame. 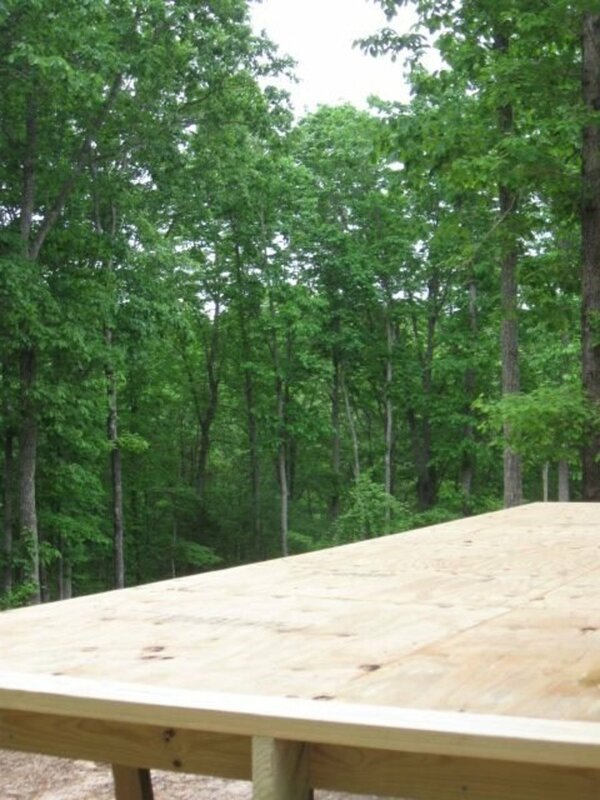 Struts are the short boards between the joists. Tip: See the soap? Rub the screws on it just a bit before drilling them in. Mr. Vix swears it makes them go in easier. One frame. It's funky looking now but I can jump on it and it doesn't budge. 9. Check to be sure the frame is right before moving on. Life gets so much easier from here on out. The hardest parts are done. If there is a mistake or missing piece, now is the time to correct it. Once the decking goes down, you have to crawl underneath for such repairs. This is not something typically desired, unless you are my puppy who wants to dig holes under this. 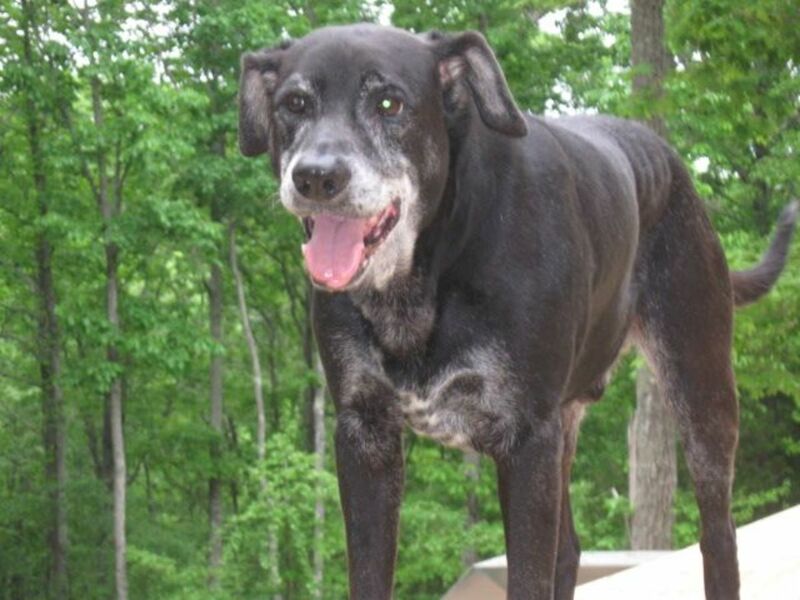 Be sure to keep kids and pets at a safe distance when using power saws. 10. Bring on the saw! It's time to cut off the tops of the posts level with the frame. A sawsall or more appropriately a reciprocating saw would be best for this step. Not having one, Mr. Lytle cheated and used a small chainsaw. It worked fine. 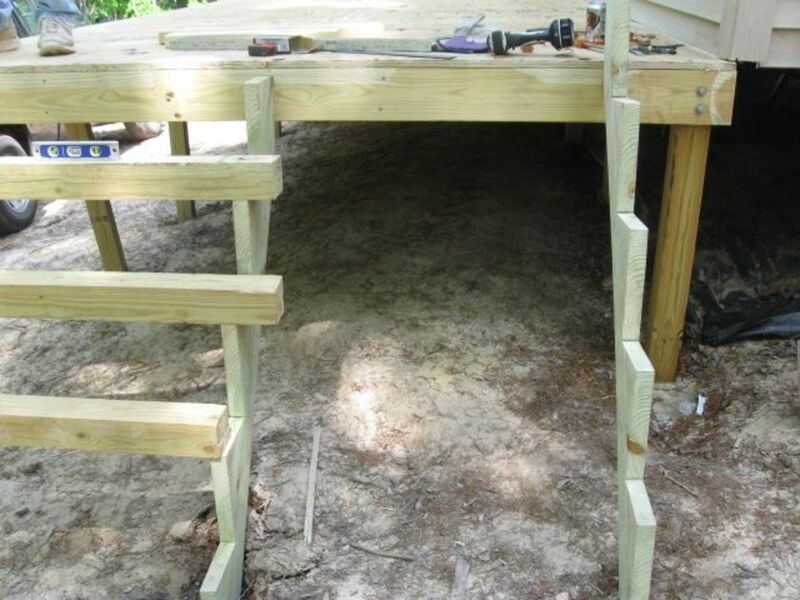 Either way, be sure to wear a face mask and safety glasses when doing this step, or any work using a power saw. 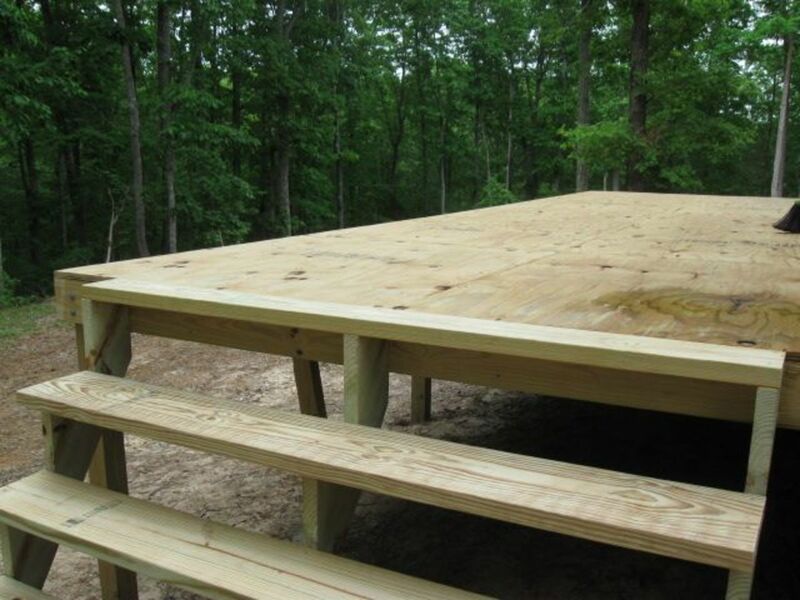 If allowing folks to walk on it yet, be sure the decking board is secured or it can flip. 11. 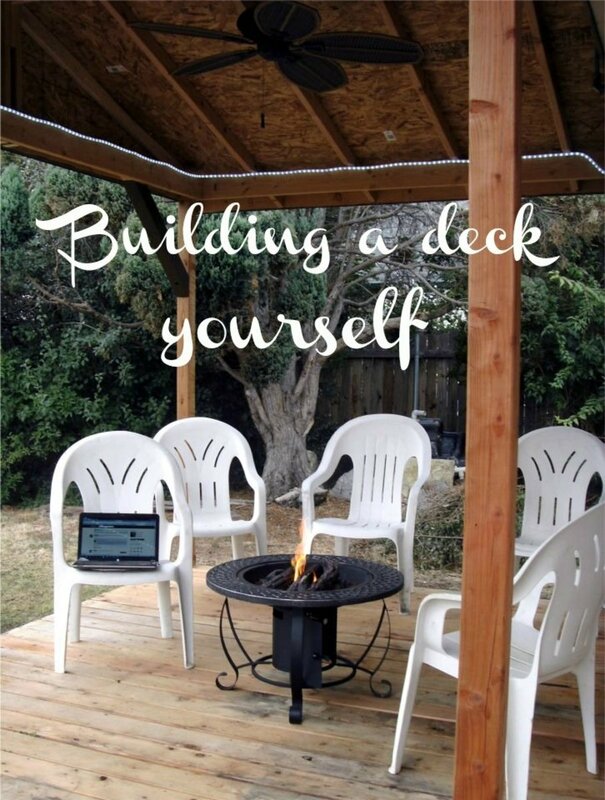 Let's get to decking. Lay the plywood and screw it down using one and one quarter inch screws. Start at one end and work your way to the other. It will take two sheets per row. The last row only will require the plywood being cut to fit. Be sure to let the dog supervise ;). Elwood gives it two paws up at this point. He refuses to give until it's done and he gets to go fishing. If the plywood won't cooperate, jump on it. 12. Make it all lay down perfectly flat. Mr. Lytle insisted that I relay to you that the quality of plywood available these days leaves something to be desired. It is neither perfectly level nor free from deformities. To be sure to get seams that line up well, he offers up the following advice. Tip: Jump and scoot. It sounds like a dance, huh? I saw him do it though. It works when an edge is just a hair off lining up flush. Another tip: Get your wood from the lumberyard. While Lowes and Home Depot are cool for all kinds of stuff, the lumber yard has better, straighter boards at better prices. Woo is wore out from all this building. 13. Be sure to take care of yourself. Once all the pieces are laid and drilled securely into place, take a breather. Woo was plumb wore out by this point. Seriously, you must be sure to take care of yourself, especially if you are not used to hard manual labor in the heat. Be sure to stay hydrated and take breaks. 14. Let's put some steps on this deck. This thing is up three to four feet high depending on which side you are standing on. Steps are required. We used three pre-made risers. 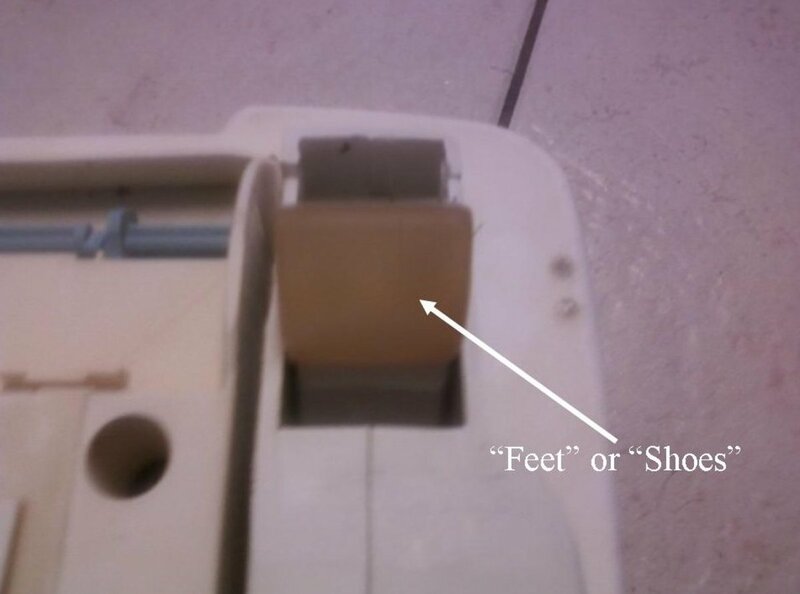 Measure each attachment point separately from the ground up before cutting risers. Attach with screws. Here, we had some left over four by four posts just laying atop to give us an idea how it would look. Elevated decks make for great views. 15. The trick to steps is good measurement. We used four two by tens here to make the steps. Each is attached to the risers with two and a half inch screws. The top step is a two by eight. Tip: Start the steps at the bottom. If you start at the top and work down, it's somewhat awkward using the drill due to spacial limitations from the stair above. You're done! One DIY deck on a budget was just born. Teach the puppy to climb the stairs and kick back. When building an elevated deck, if you have small children, consider installing a child gate or railing or tiny people will fall. The front view from the deck. Enjoy the fruits of your labor. Then, get to sealing it. 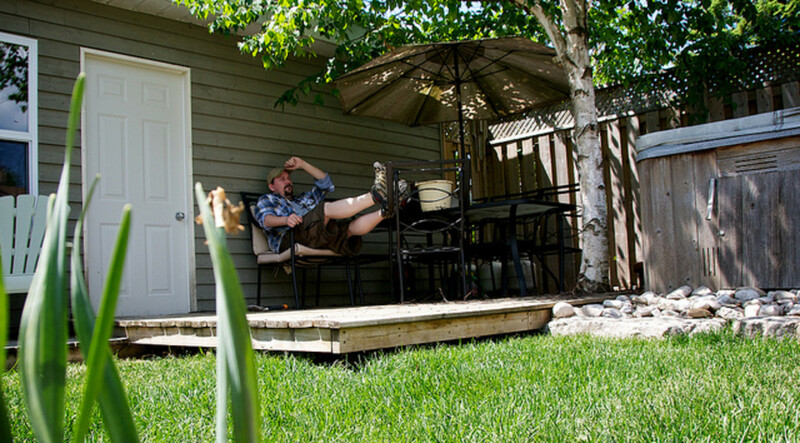 Scope out the view and contemplate how you want to finish off the deck. At this point one could stain, paint, tile, or any number of options. The only functional parts remaining on ours are the handrail and under penning. But, we are tired now so that's a project for in the morning. Some extra tips and tricks for building on a budget. Tip: Use cordless power tools when possible. They are safer because you don't get tangled up in or trip over the cords. 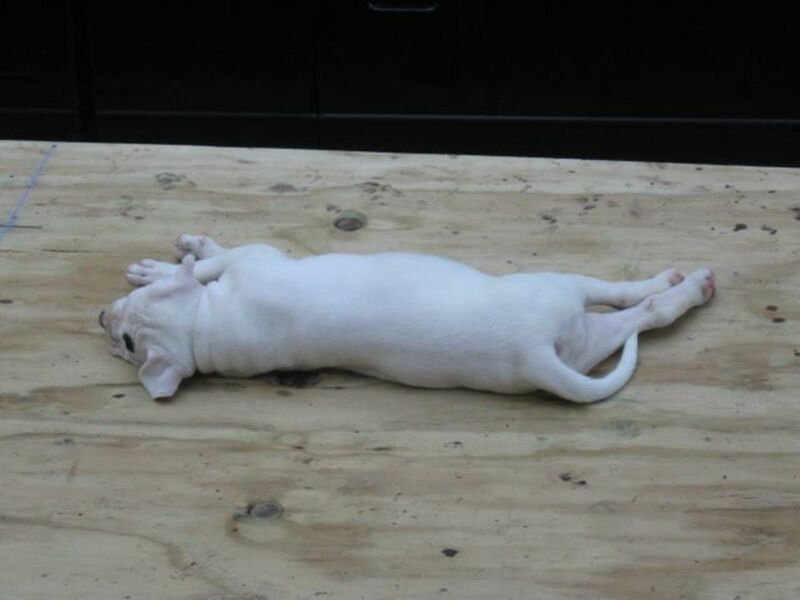 Further, around here cords are like gold for puppies. I don't know why but they always want to chew on them. Once the insulating cover is compromised, it's really not safe to continue using the tool. 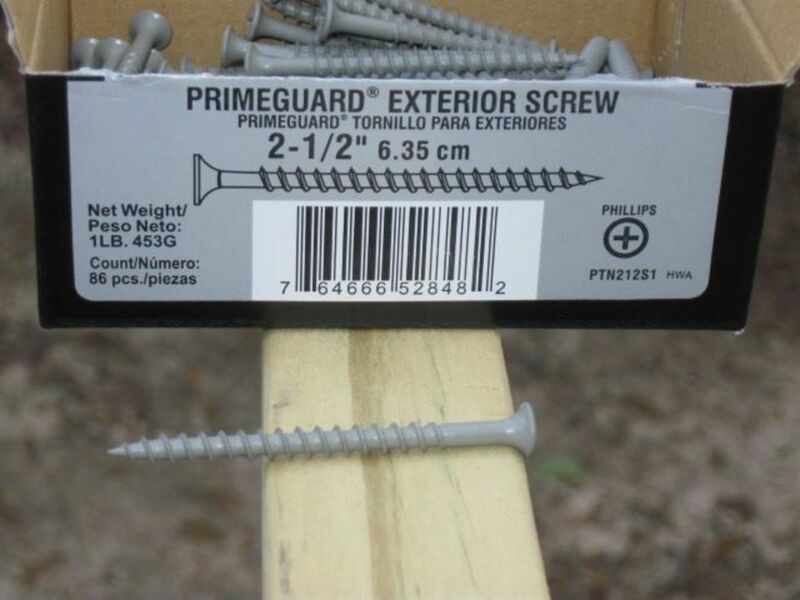 Screws come in different grades and sizes. 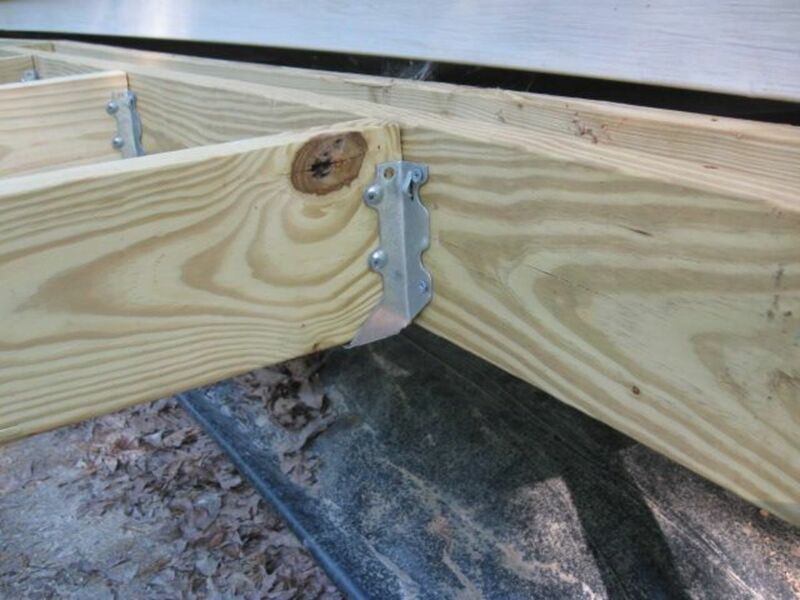 Tip: Be sure to use exterior grade screws for outdoor projects. Tip: If finding a slightly warped loist or strut board in the frame, use bar clamps to train it into place. My poor deck is screaming for paint right about now. 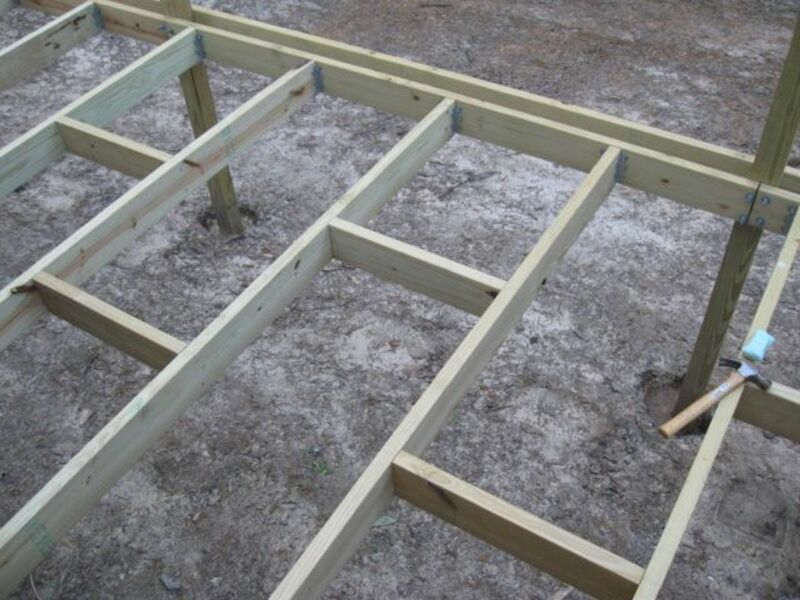 Tip: If dealing with a slight up or down warp in a framing or joist board that, use a four by four scrap to push it up gently until it re-warps the way you want it. Just be sure to point that side down when framing. See the croocked looking post? That's exactly what it is doing. It's just standing there, not set in concrete or anything. In a day or so, it will have done its job and the slight bend in the two by six framing board will be gone. For new lumber, you would think such would not be a problem, sadly that's just not the case. 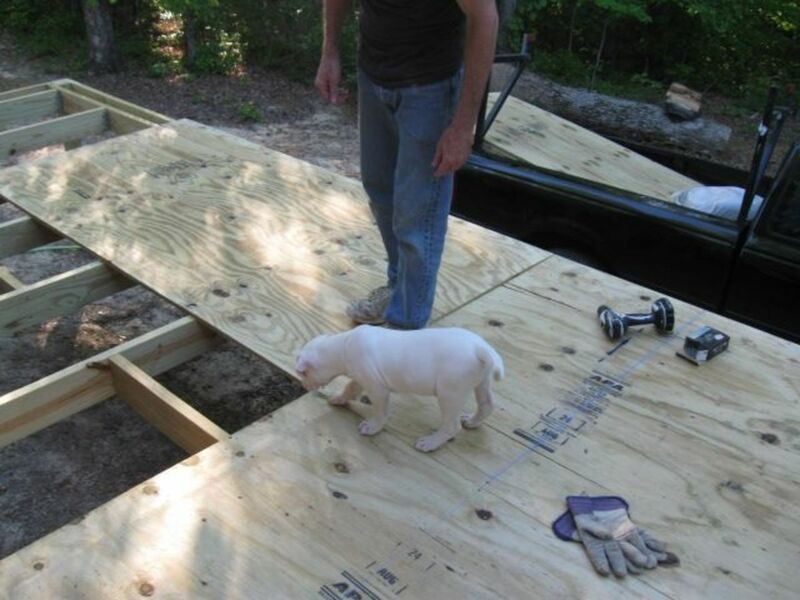 Elwood is ready to go fishing having finished the deck. A finished job is so rewarding, especially if you saved a boatload on it. Grab the dog and go fishing. You're done for the day. There's always more work to be done and nothing ever comes out exactly perfect. It's all good. Munch on some catfish tonight and worry about applying some sealant tomorrow. My husband says this the best powerdrill. He had me use it and another one just to see. Honesly, they both made holes. One hole was just as good as the other. However, the Makita drill took a lot less effort on my part to make that hole. It was quieter, not as heavy and I didn't have to push near as hard with it. 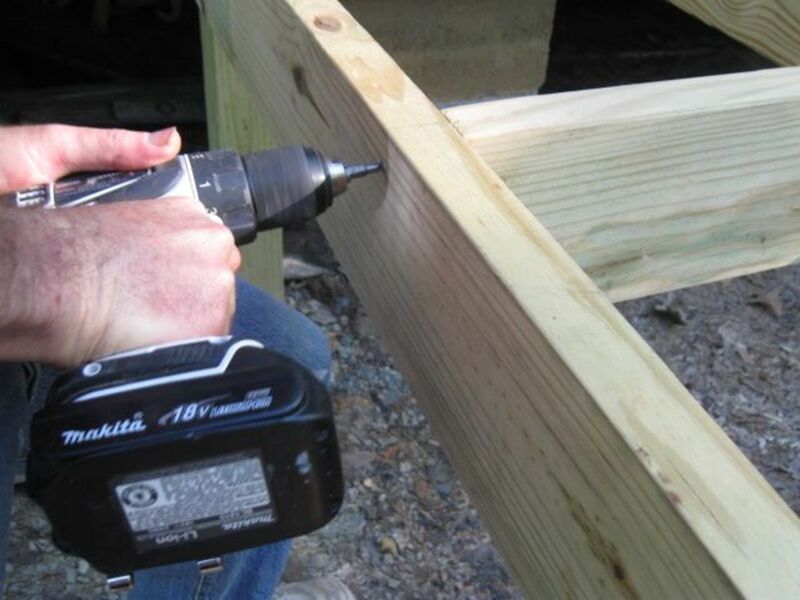 How to use a power drill created by Ace Hardware. Check out the following video for advice on how to use a drill safely. If you are anything like me, power tools are not your favorite. Don't get me wrong, my glue gun is my best buddy, but drills and saws, not so much. While my husband grabs them up and goes like no one's business, they give me pause. Such tools can be dangerous. Check out this video by Ace Hardware to get a good idea of how to properly use the tool in the safest manner possible. Using the saw is more dangerous than using the drill. While I have overcome my fear of the drill, the saw is another matter all together. As someone who is highly accident-prone, I have enough sense to know that this tool could kill me. Does that mean I won't use it? Not a chance. It means I want to know everything I can about how to best use it. I'm blessed to have a great husband who teaches power tools whenever I ask. But, he won't make a video. This guy is really good too. Check out the brief tips provided for safely using a power saw before you grab one up. Building your own often results in a better product at a better price. Whatever it is you want to build, don't let things like inflated pricing and scary tools stand in your way. Give it some thought. Make a plan. Go for it. Image credits and content copyright; Rhonda Lytle 2014. What kind of DIY projects are you contemplating? Do you have a tip or trick you would like to share? We would love to hear it. Cat, there is nothing wrong with the way this was written. She was not belittling the female gender. Today’s society is offended by EVERYTHING! Get over it! Sorry, "female speak" ? I'm a woman, and I know a lot more about carpentry and masonry than my boyfriend does. I don't see the sense in belittling a gender just because you feel the need to make an excuse for not bothering to learn technical terms for the project you're doing. Hello, I was wondering if you knew how much weight your platform could hold? I am looking to build something similar around an oak tree for a wedding where the dancing will be held. Thanks in advance. Looks great but I would be very careful about the amount of weight on the deck. Instead of the weight of the deck sitting on the posts, it is being transferred to the posts via the carriage bolts bolted through the posts. So the amount of weight your deck can handle is now based on the shear strength of the bolts themselves. 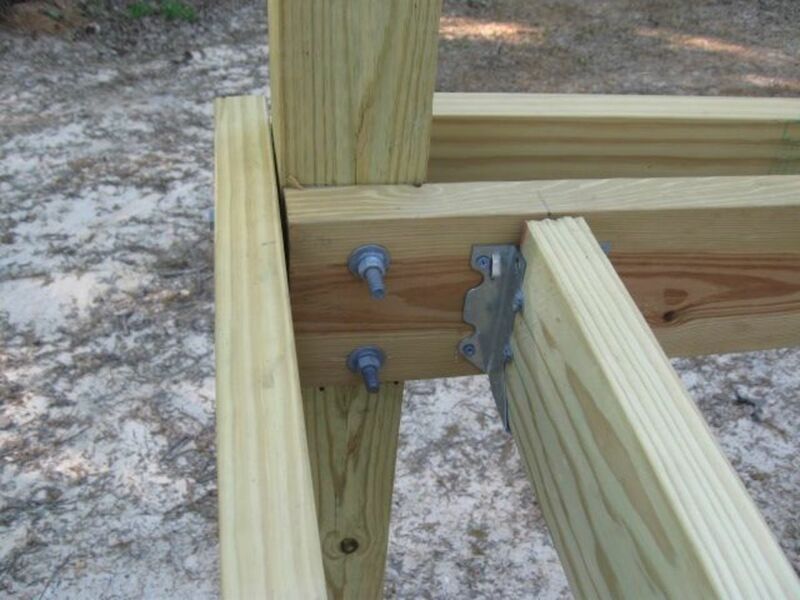 A better method is to cut a notch in the posts so the "perimeter frame" is sitting directly on top of a portion of the post, and then attach the carriage bolts through the remaining portion. Hi! Great tutorial, very well documented and informative! My wife recently asked me to build her one, however we have to stay on the concrete pad; our landlord will not allow us to dig in the yard. That will be my greatest challenge I believe. @Scott A McCray: Thank you :) Finally got started painting. Needs another coat and sealant and should be done. God bless. Impressive job! So many really good nuggets of information, like always using screws instead of nails. 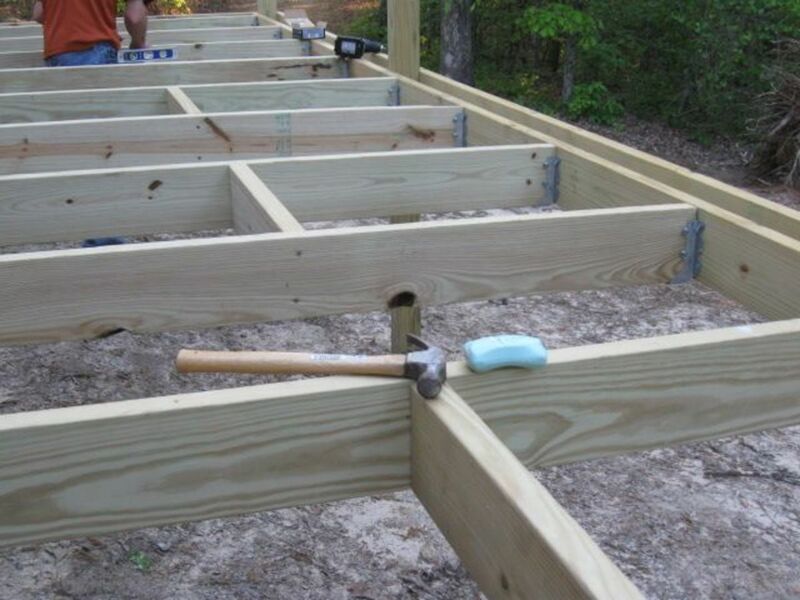 I despair when I see people installing exterior decking with nailguns! When you mention that you set the carcass good and level, did you not allow for a slight fall to drain water? Outstanding DIY lens - can't wait to see the next phases documented! @DANCING COWGIRL: Right now it's too hot to get much use during the day but evenings and nights see us parked there everyday :). Thanks bunches for the drop by and kind words. God bless and Happy Fourth of July weekend. Wow, what a great job. I was in on a project like this before so I can surely appreciate your hard work. Hope you enjoy it! @flycatcherrr: Thank you very much. It's not fancy but it's highly functional and fun to sit on while watching the puppies go bonkers :). @favored: Thank you. It's a work in progress at the now. The puppy is trying to go w/out the stairs these days and just jump straight up or down. It's not going so well, yet :) Blessings. @tazzytamar: I'll pass that along to Mr. Vix. He will love it. :) God bless and most happy building on your next project. It turned out really nice and the puppy seems to have no trouble with the stairs. This looks like it was professionally made. Very clever and a brilliant, informative lens! @takkhisa: Oh, thank you :). That's the sweetest thing to say. The posts for the handrails just got set and it looks like sun so I'm hoping to get it painted very soon. It seems every time I grab the paint brush it pours. God bless! This is one of the best DIY lenses I have read lately! I am not sure If I would try this but thanks for the great tutorial. @Adventuretravels: I wish you tons of success and good weather. Every time I break out paintbrush so far, it starts pouring down rain. God bless and happy building! Wow this is such an awesome lens. Thanks -I'm going to have to build something similar in my garden -soon -and I had no idea where to start! This is very timely. @Heidi Vincent: LOL this thing encompassed taking a few breaks. I've got the paint and everything to finish it out now but the weather isn't cooperating, yet. Blessings! @georgepmoola2: Thanks, George. I'll be so glad when this on and off rain stops and I can paint.